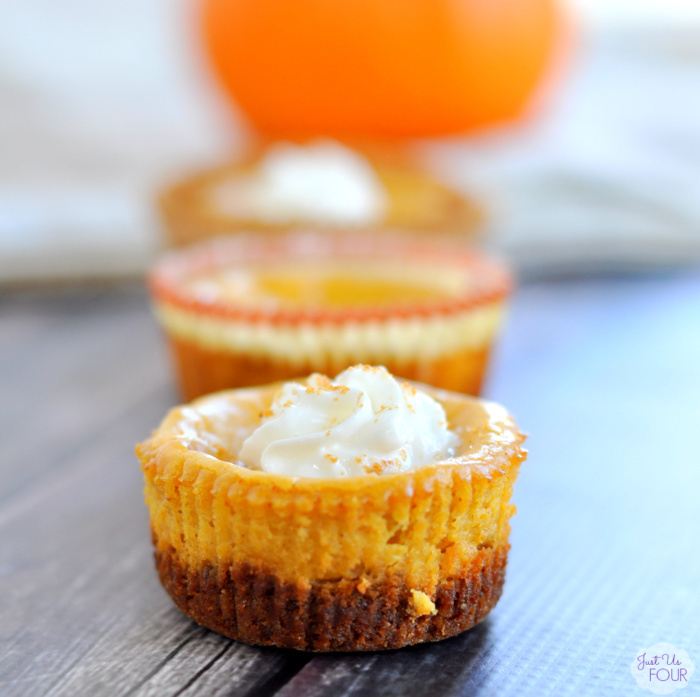 TBT: Mini Pumpkin Cheesecakes - An Easy Pumpkin Cheesecake Recipe! One of the great things about this super easy pumpkin cheesecake recipe is that you can easily make the mini pumpkin cheesecake ahead of time. Just keep them chilled until you are ready to serve. I make these individually sized pumpkin pie cheesecake bites in a regular muffin tin. You could make them true pumpkin cheesecake bites by using a mini muffin pan and reducing the overall baking time. If you choose to top them with whipped cream as shown, be sure to add it just before you are ready to serve. A little sprinkle of pumpkin pie spice and extra cookie crumbles go perfectly on top too! 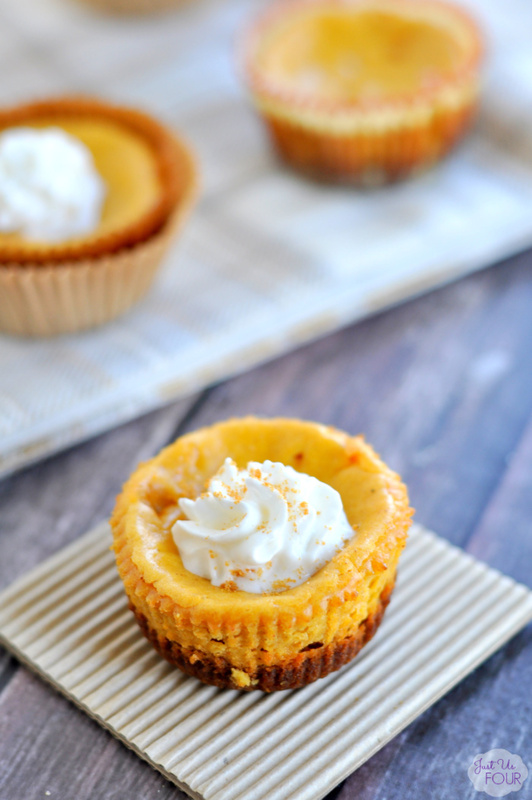 These mini pumpkin cheesecake with gingersnap crust are amazing! I make them all the time during the fall and they will definitely have a place on our holiday dessert list! What are you favorite Thanksgiving desserts? 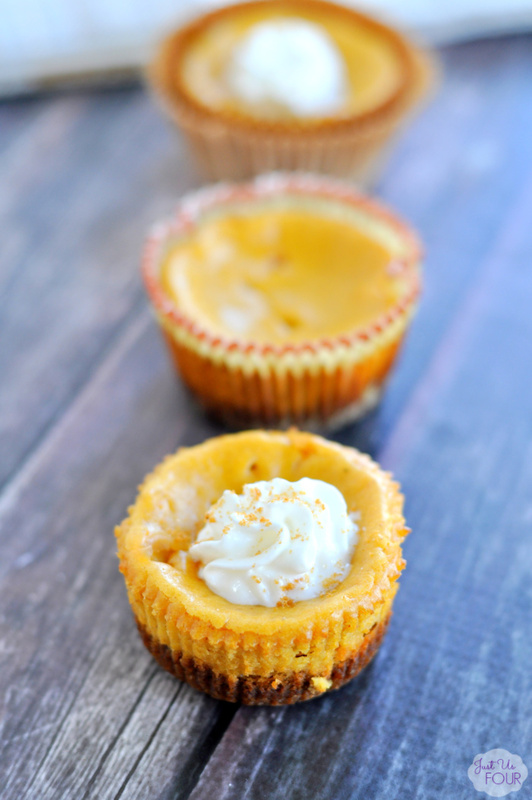 If you make these mini pumpkin cheesecake, I’d love to hear about your experience. Let me know in the comments or snap a photo and tag it #MySuburbanKitchen on Instgram or Twitter. 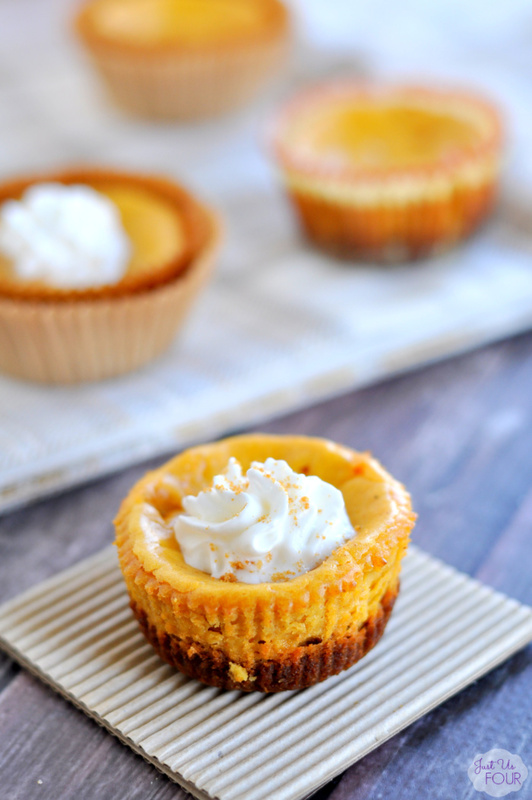 These Mini Pumpkin Cheesecakes need a place on your dessert menu ASAP! They are the perfect size, can be made ahead, and taste absolutely delectable too! Preheat oven to 350 degrees. Line the cups of a muffin pan with paper or foil cupcake liners. Add cookies and 2 Tbsp sugar to food processor. Pulse until the cookies resemble bread crumbs. Reserve 1 Tbsp crumbs. Add melted butter to remaining crumbs and stir to combine. Press approximately 3/4 Tbsp of the crumb mixture into the bottom of each of the muffin cups. Bake at 350 degrees for 10 minutes. Remove from oven. Meanwhile, add cream cheese to food processor and beat until smooth. Add sugar, agave syrup, pumpkin, eggs, egg yolk, flour and spices to food process and let run for 1-2 minutes or until fully combined. Divide cream cheese mixture between muffin cups on top of baked crush. Each muffin cup should be approximately 3/4 full. Bake at 350 degrees for 30 minutes or until middle is set. Cool completely and then top with whipped cream. Sprinkle with reserved cookie crumb mixture. I made these and they are wonderful. Two questions…. First, can I make these ahead and store them in the fridge? Second, I used regular size muffin cups. Did you use miniature muffin cups? Hi – Yes! I make them and store them for 3-4 days in the fridge all the time. I use a regular sized muffin pan. I am pretty sure these have just replaced traditional pumpkin pies in my house, because holy wow, you can’t get much better than these delightful treats! We don’t bake traditional pumpkin pies anymore either. Everyone prefers the cheesecake. I love mini desserts like these yummy little cheesecakes!